It’s that time again to get curious, to get adventurous and to get ready. 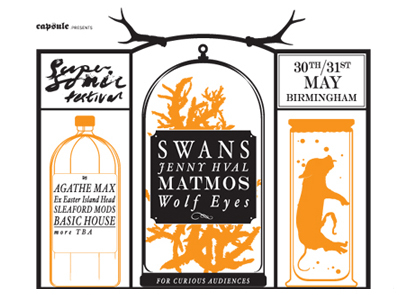 After taking a year out to re-imagine the festival following our tenth anniversary, Supersonic Festival is now back and going old skool in special two-day “Limited Edition” format this May 30th-31st. Tickets HERE. Supersonic Festival’s playground for 2014 will be the iconic Custard Factory, home of Capsule HQ. This ever-evolving industrial arts complex will shapeshift once again this May to play host to Supersonic’s enticing programme of experimental music, film and art. But this is Supersonic “Limited Edition” don’t forget, so expect a few extra special treats… and remember tickets are limited to 400 so do not miss out. Keep your eyes peeled for further line-up announcements over the next few weeks. Tickets are available from HERE.